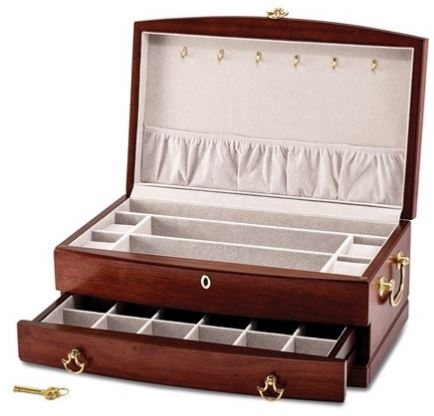 A beautifully designed wooden jewelry box with locking top and single drawer. Makes a wonderful jewelry chest for the mid-size jewelry collection. Handmade, and top locking jewelry chest with a plush velvet interior ensures security and protection for your treasures. The top contains ring rolls, multiple compartments, and 6 necklace hooks with shirred necklace pouch. The single drawer features 12 protected compartments. 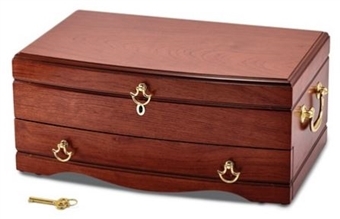 This elegant jewelry chest measures approximately 12" wide x 6" deep x 5" high. Cherry Matte Finish 3-Drawer Locking Jewelry Chest Black Five Drawer Jewelry Armoire - Ningbo Chinese Style (3 Left!) 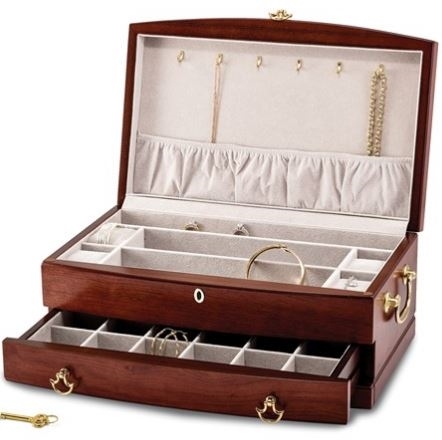 Locking Wooden Jewelry Box 3 Level Upright White Jewelry Box Armoire with Necklace Holders.